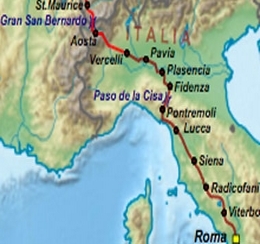 The Via Francigena is one of the classic pilgrimage routes. A 1900 km journey, through England, France, Switzerland and Italy from Canterbury to Rome It follows the general direction taken by pilgrims to Rome in previous centuries although alternatives paths are used in places where the original route has now become a modern road. The Via Francigena which means litterally the “French Way” is first mentioned in a parchment in the abbey of San Salvatore al Monte Amiata in 876 AD. 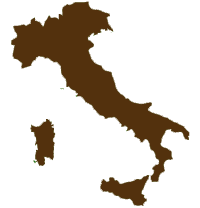 The following stages cover the Italian part from Aoste to Lucca in 27 stages. You can choose to walk for 7 days, 10 days, 14 days or more. The walk starts in the Asote Valley in Lombardie and gradually enters the Tuscany and its soft hills. This first walk combines ups and downs in the Valley. You are surrounded by the vineyards along the footpath and numerous Castles like Quart, Nus, Cly and Fenis that you can see in the distance. Dinner and night. Follow the way to Châtillon and Saint Vincent where you will walk on the left side of the Valley towards the amazing Saint Germain Castle. The way goes down and then you can reach Verres where you will spend the night. A rich cultural stage today with the splendid St Martin Church in Arnad, the crossing of 2 antique bridges in Echallod and Bard and above all the entrance of Donnas along the roman road of the Gauls. You will end that stage in front of the roman bridge of St Martin. Night in Pont Saint Martin. The relief becomes softer, the slopes less tough and you follow the way combining villages and nature. Once in Ivrea take the time to visit the historic center of the city. Night. Walk along the lake and towards Albiano d’Ivrea and enjoy the view over the amphitheater shaped by the moraine. You continue walking on peaceful roads to reach Azeglio and the Sanctuary San Antonio Abate. After the sanctuary keep on walking on a trail up to Alice Castello. End the day in Santhia. The stage crosses Vercelli plain and rice fields where numerous birds species live. The walk follows footpath of pastures and rural roads. In Vercelli you can admire the 2 towers of dell’Angelo and di Citta. The walk unfolds on tracks along rice or corn fields close to the Ticino. Pavie is enchanting with so many treasures :Santa Maria del Carmine, The Certosa di Pavia as well as the oldest monument the San Pietro in Ciel d’Oro Basilica or the Duomo. Once you leave Pavie you take very peaceful roads up to Belgioioso. This short stage leaves the time to visit the fortified castle of the city. This stage leads you to numerous small villages like Corteolona and Chignolo Pô Train to Ospedaletto. Dinner and night. Short walk to Cadeo. Dinner and night. Today you leave the Via Emilia behind you and follow twisting roads. Short stage up to Fiorenzuola d'Arda. A rich heritage all along the stage up to Fidenza. A lot of villages with a rich religious heritage during this stage. You leave the Po plain behind and enter the Appennines. The terrain is hilly. Stopover in Medesano. When you leave Medesano, you walk across a hilly landscape. After Felegara, you will find a natural area along the Taro River. From Fornovo di Taro,the relief is more challenging and offers varied landscapes. Dinner and night close to the reserve of Mone Prinzera. When you reach Terenzo, you will observe the bell which formerly rang to help the pilgrims on foggy days. From there the path looks like a mountain track during 3 km and then you will find back a winding road up to Berceto, a charming mountain village where stands the monastery built by Saint Moderrano. The stage on paved roads all day long crosses however the Roman remainings of the former via. Night in Villafranca in Lunigiana. From Villafranca in Lunigiana, you will cross the fortified village of Lusuolo. At the end of the walk you reach Aulla, 30th stage of the Sigéric route. In Aulla you can visit the Fortezza della Brunella and the ruins of the Castello di Bigliolo. Night (dinner not included). You walk starts with a steep slope up to the fortified village of Bibola then the path continues through the mountain to reach Ponzano Superiore. Then you will enter Sarzana for the night. En partant de Massa, vous marcherez sur une route un peu plus rural que celle de l'étape précédente. This stage is more rural than the previous one. Capanne and its castle, Pietrasanta and the beauty of the Duomo square, the Pretorio Palace or the Saint Agostini Church. Dinner and night. When you leave Pietrasanta, the landscapes are typical of Tuscany. Up to Camaiore, the Villas with exotic gardens, the hills covered with olive trees and cypress will be your background today.Dinner and night in Monsagrati. Your way goes on a small paved road, then crosses small villages and modest chapels to find back the road a little farther. 4 hours later you will reach Lucca and its numerous monuments: Guinigi tower, Bernadini Palace, the Duomo, San Giovanni and San Frediano churches. The 2 squares San Michele and del Mercato are also must-sees in this lovely city. You are buying directly from CHEMINS DE FRANCE company.